South Korea’s leading mobile carrier SK Telecom Co. posted a 25.9 percent plunge in operating profit for the fourth quarter last year due to state-forced mobile fee discounts. SK Telecom announced in a regulatory filing on Thursday that operating profit in the October to December period last year amounted to 225.3 billion won ($202.9 million), down 25.9 percent from the previous quarter. Sales rose 3.9 percent to 4.35 trillion won thanks to the sound media, security and new growth engine businesses. 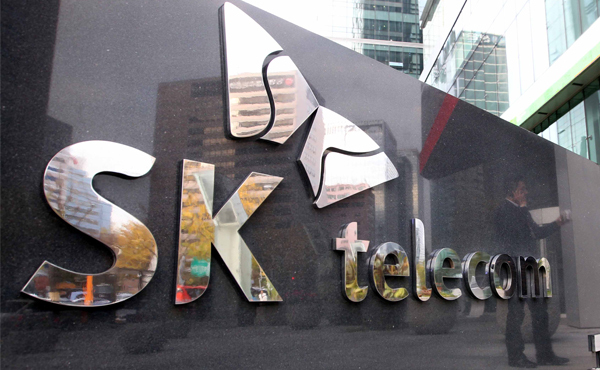 Shares of SKT on Thursday fell 0.19 percent to finish at 258,000 won. For full 2018, SKT’s operating profit on a consolidated basis dropped 21.8 percent against a year ago to 1.22 trillion won and revenue also fell 3.7 percent on year to 16.87 trillion won. Net profit, on the other hand, soared 17.9 percent to 3.13 trillion won, boosted by the record-high earnings of its chip-making affiliate SK Hynix Inc. in which the telecom firm holds a 20.07 percent stake. The poor operating profit was attributed to the rise in subscribers of flat-rate promotional fee system and eight strategies it implemented to lower phone bills and restore customer confidence, the company said. Thanks to the policies, the company added 185,000 new subscribers last year and recorded the lowest rate of attrition at 1.22 percent. 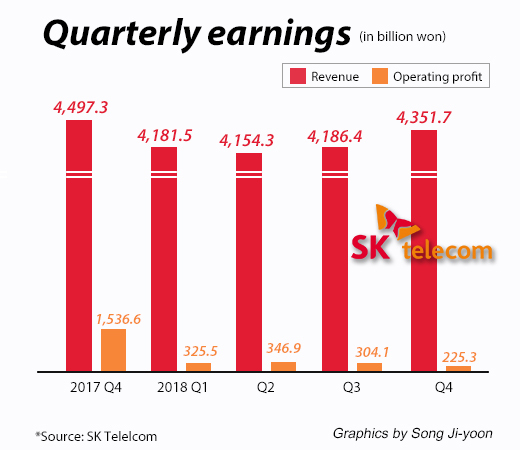 Its internet service arm SK Broadband posted a record high operating profit of 175.6 billion won on sales of 3.25 trillion won in 2018 thanks to brisk media business. The number of subscribers for its internet protocol TV (IPTV) rose about 10 percent on year to 4.73 million, and the share of subscription to its premium UHD service for the first time exceeded 50 percent in the entire subscribers. SKT plans to ramp up the fifth-generation (5G) network service this year and strengthen new growth engines including media, security and commerce.